The game of golf can be like a meditative experience. After all, silence or at least whispered voices are encouraged while engaged on the links, and a high degree of preparation and readiness are important ingredients for success. The vast blue sky and uninterrupted greens and trees encourage a oneness with nature. And then there is the hushed silence and concentration required as the player executes their swing from start to finish. Unfortunately, one barrier to the strong and smooth follow-through of that swing is tight hamstrings. Just as in seated meditation, tight hamstrings can challenge one’s concentration! Tight hamstrings can break even the best golfer’s concentration. 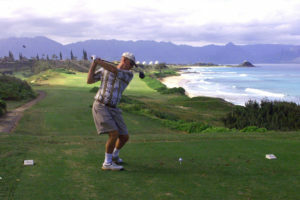 Yoga inspired breath and focusing exercises have much to offer the golfer. Stretch and strengthening techniques that specifically improve the health of the shoulder, neck, core and hip muscles are available through the physical practices of yoga. For now, let’s focus on the role of the hamstrings as applied to golf, particularly on exercises for tight hamstrings. The primary work of the three muscles that comprise the hamstrings is to flex (bend) the knee, and extend the hip joint. The hamstrings, located in the back of the thigh, are also involved in internal as well as external rotation of the leg. The three muscles of the hamstrings are semitendinosus, semimembranosus , and the biceps femoris. Check out Joe Muscolino’s website for a great illustration and fabulous anatomy information. Flexibility in the hamstrings will provide you improved range of motion in the hips. Therefore tightness in this area will limit your range of motion while executing all three phases of the golf swing: back, forward and follow-through. Westerners spend an inordinate amount of our time sitting. As we eat meals, in school from first grade throughout school, driving or riding in cars, and most likely at work time-our primary posture tends to be seated. Of late, there has been much more public awareness related to lack of movement as a health concern. However for the most part, our hamstrings are shortened as we are inactive in chairs. Try this: loop a rubber band around your thumb and first fingers. Picture the rubber band as your hamstrings. When those fingers are bent (like our knees), the rubber band is lax and limp. When you straighten the fingers, the rubberband is lengthened, a position our hamstrings do not typically experience. The upper hamstrings are attached to the bottom of our pelvic bones, referred to as our “sits” bones or more accurately, the ischial tuberosities. As mentioned earlier, short, inflexible hamstrings can also limit the flexibility of our hips, and through a chain reaction in our bodies, contribute to back pain, another common issue for golfers (well, almost everyone!). The strong and flexible action of your hips and lower back are an essential ingredient for integrated action of the golf swing. Keying in on hamstring flexibility will improve that action. Steady practice of simple hamstring stretches to increase flexibility is a must for most golfers. It is always preferred to stretch every day, for 5-10 minutes, than to expect results as a “weekend warrior”. Reclined leg stretches are a tried and true method of opening the hamstrings as well as increasing strength and flexibility of the hips. A yoga strap, or even a men’s necktie can be used to increase the sensation of stretch. The famous downward facing dog pose can be practiced with hands on the floor or on the wall. Downdog stretches the hamstrings and also provides a wonderful release in the spine. Ball massage will provide a release of lingering tightness in the back or hamstrings. Increase your hamstring flexibility for a multitude of benefits on the golf course! Check out upcoming teaching schedule here. For questions about private and semi-private sessions, contact us! We’d love to hear from you. A version of this article was originally published on www.yogatuneup.com.